It's been a while since my last post but the CNC machine has not been sitting idle. I've been making the usual bit and pieces for my wife Carol, all her needs for her Patchwork Quilts. 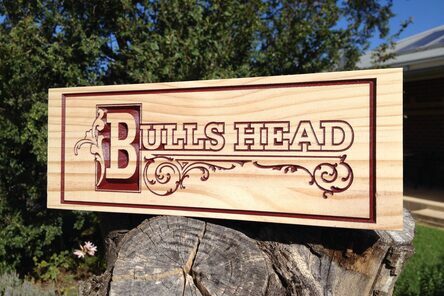 Recently I had a acquaintance that I had shown some of my CNC work to as me if I could make a sign for pedigree dogs. The sign part was simple enough I told her but she also wanted a picture of her dog added at either end of the sign so now I have to learn about 3D carving using Aspire software to generate the needed files for the carving. 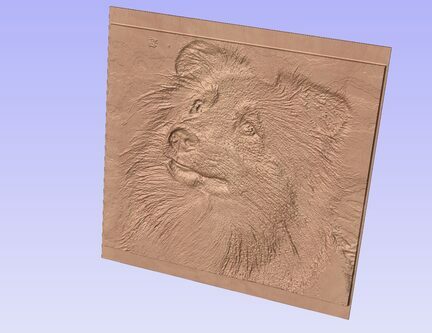 I have a picture of the dog to play with and have had a quick go at making a 3D file for carving and only having seen a couple of video tutorials on YouTube this will totally new so I have a first go at the dog file and it's pretty rough but not bad for a start. 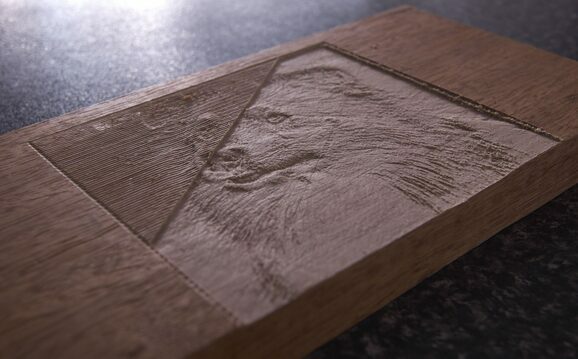 The image will be only 200 x 200 mm in size maybe 250 mm square at the most and will not be a fine detail model but a representation of the dog carved with a 1/8th round nose bit. This is a sample of my first go at the file. So now I just have to perfect the smoothness and few other things to make it look the way she wants and have a practice run on a bit of scrap wood. Aspire tells me it should only take about an hour to an hour and a half depending on size. 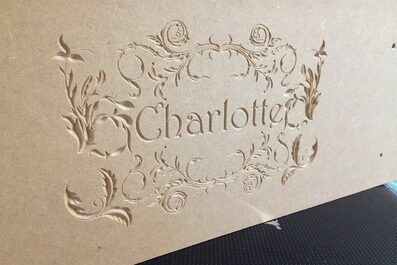 After a long cold winter and then a very busy few months at work I have finally resumed some work with the CNC. As the old sacrificial base board was getting a bit tired I decided to do what I had originally wanted to do and that was to fit a series of blind nuts under the board in a grid spaced at 75mm allowing clamping over the entire base making it a lot more usable than before. The original blind nuts ordered were 6 mm but I received 2 lots of 4 mm as previously noted in this blog so I decided to use them anyway. If the bolts are too short I have threaded rod that I can cut to length to suit. I had also shimmed the table to level it to within +/- 0.07 mm and that should be level enough for my work although some of the engraving I want to do on the Perspex templates might require a little more accuracy. If that is the case then I may need to invest in a spring mounted engraving tool to soak up any imperfections in the table top. The new optical limit switches are here and look to be ok for the job at hand although it's yet to be decided if a NO or NC setup is to be adopted. I purchased ten of the them so I would have a couple of spare for other purposes such as homing switches but that's something to think about later. I've not been to the shed much as it's been very cold this winter and I still have to figure out what voltage these run at and then where to power them from, I may need another small power supply just for the switches. I'll Google the data sheet on the switches and go from there I guess, it shouldn't be too much of an issue. There is no rush to do this as I'm mostly working with Perspex/Acrylic sheeting or wood so this little mod is only to improve the robustness of the machines operating envelope and that of high frequency vibrations when cutting metal causing the micro switches contacts to bounce and thereby causing the machine to go into an Emergency stop. If I set these up as normally closed I will only need one switch per axis as it will need a rail in the switch at all times during normal operation with a gap at either end of travel to allow the switch to go open circuit, at least that's how I think they work, it may be the other way around. I'll take them to work with me tonight and test their operation along with the info from the Google search. Its been a little while since I posted but there’s a bit going on. The dust hood hasn’t been as big a success as I would have hoped for due to the router fan pushing more air into the hood than the vacuum can pull out so it winds up blowing out from under the brushes, so I need to look at redirecting the air from the router somehow. A work in progress. Next on the list was to level the bed and I had done this to the main bed, a 25mm thick piece of MDF with some brass shims to within about 0.006” and that’s not bad for a piece of manufactured wood over an area 450mm by 650mm but as I have a need to do some 0.005” deep engraving into Perspex sheet over a reasonably large area I needed it to be perfectly flat so I ran a 16mm end Mill “Router Bit” as a fly cutter over the sacrificial bed a 19 mm thick MDF panel and now it is perfectly flat as needed. The weather here has been horrendous so I’m not spending as much time in the shed as I would like, went out there today and it was 4º C, that’s fridge temperature. 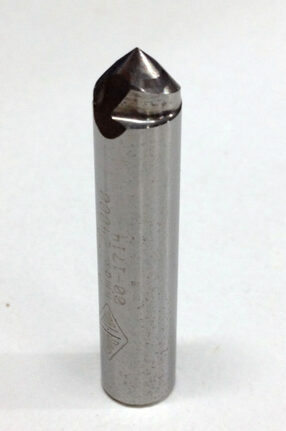 I had tried a couple of different tools for doing the engraving from a 90 and a 60 deg V bit both running and stopped like a diamond drag and neither was very good as the finish was rough and not desirable at all. an d a YouTube demonstration that showed it to work quite well on Perspex as I need. 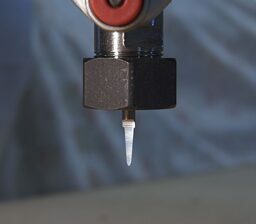 So as I like to make what I can and I just happened to have a nice piece of tungsten handy, “a broken ¼” straight router bit from an earlier post”, I set about putting a an approximate 120º point on it. As it was only very short it was difficult to hold while grinding so I put it into my cordless drill and that allowed me to not only hold it but rotate it at a very steady slow speed at my Greenstone wheel, this the special grind stone for tungsten. I am very happy with the result, not quite 120º, more like about 85º I think but the test I ran on another template for my wife’s quilt making it worked quite well with a finish that is quite acceptable. So now with the bed leveled and my custom engraving tool all I need to do is put it to the test. This is the Quilt templates piece that I will be engraving and cutting, it’s the same as the ten and five inch I’ve done before but it's a smaller set for an 8.5 inch pattern as can be seen and this will be cut all at once, this is approximately 18 inches in the X axis and by 10 inches in the Y axis. 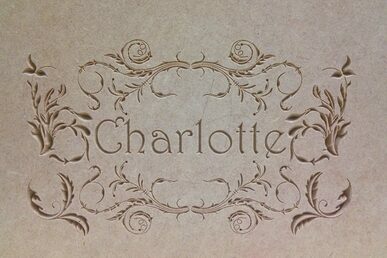 This will be the next job on the bed and with the new engraving tool a better finish will be achieved. Well as we go along and all seems well with the world another small annoyance pops up. Decided I was going to do a small job in aluminium, nothing too large just a small bracket to mount a 25 pin D connector for the breakout of port 2, this was to be the first metal cutting job and done with a 1/8th end mill. Drew up the detail and generated the code and off to the machine, setup and away we go, about 10 mm into the first pass and I get an Emergency stop. No apparent reason so reset rewind and start again, about another 10 mm further into the cut and another Emergency stop???? This process went on for another dozen times until the job was finally cut but unfortunately with a minor error on a restart from the wrong point in the code. Fortunately just a test. Went out again today to find a reason for all this as the errors were a mixture of just "Emergency Stop" or "Emergency Stop with Limit switch"
So powered everything up picked up an allen key and gave one of the Limit switches a tap and bingo Emergency stop. Went around the other Limit Switches giving them a small tap and the same result, Emergency stop from a small tap causing a vibration as was most likely the case when cutting the aluminium. This vibration as it turns out is enough to cause the Limit/Micro switches break contact momentarily and this is enough to trigger the watchdog and bang an emergency stop. So now I have to go to trouble of isolating the switches somehow to stop any machine vibrations from effecting them or change the setup to a "Normally Open" but this is a less desirable way to operate as one would have to do a switch safety check before each use to confirm there correct operation. Just another annoyance of the problems of designing and building from scratch but as I work in a research and development environment this is what happens when you build something completely new. The improvements have gone well so it now it's time to tidy things up a bit. Mounting of the electronics under the side of the desk had to be rearranged to accommodate the extra break out of Port 2 from the Smoothstepper. I have rewired the Y and Z limits to to Port 2 and also the emergency stop along with the Z probing for the Auto Z Zero function testing function of all as I went. All this has allowed the wiring to be finally tidied up and now it's looking fairly neat I don't mind saying so myself. This only leaves the X axis limits to go, I still haven't decided on the mounting of the switches but will have to look at it now as it's the last of that to be done. I've been having a bit of fun playing with the Auto Z Zero it's a very neat feature to have but as you see from the rather large touch plate in the pictures that's one of the other jobs to take care of, something a little smaller I think. This leaves a small air gap but they hold quite well and so testing to come will see how effective it is. The only issue I can see is that the Trim router I use draws air for cooling in the top and blows it out the bottom and this is one of the reasons for the chips being blown all over the place so hopefully the vacuum will be enough to pull the chips away, we will see I guess. The other improvement is I've added another break out to port two on the Smoothstepper board giving me more I/O ports to work with and the main reason was so I could add Auto tool Zero function. This has been achieved with the help of Gurubrew on Youtube as he had displayed the Visual basic code to add to Mach3. It took a bit of messing around to use it as I has to do a screen grab then use some text recognition software and then edit it all in the Visual basic editor in Mach3, phew that was a task. Anyway it works extremely well with the values in the code changed to metric as I'm set up in Mach3 for that as default measurement system. 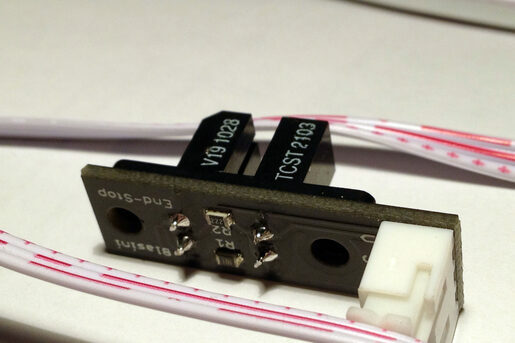 I also moved my limit switch and emergency stop functions to the new break out connector as the original 5 axis brake out board terminal blocks had poor quality screws, they were very small and difficult to work with, easily damaged. No such problems with the new connector. All the electronics have finally been mounted under the edge of the desk I'm using as it had a perfect recess under what was the front of the desk, it's about six inches deep, just the spot. 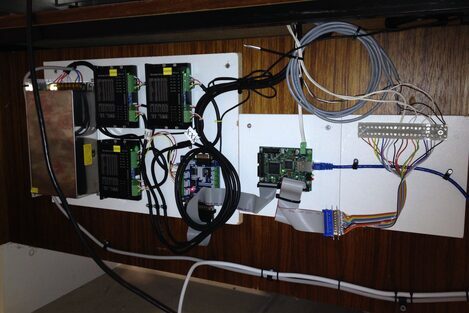 As you can see I now have to tidy up all the wiring as it's currently a mess while testing has been going on. I have needed to make a dust hood as a large number of jobs I'm doing are cut from Acrylic or more commonly known as Perspex. Cutting this material makes a lot of statically charged chips that are thrown everywhere and stick to everything making somewhat of a mess that is a pain in the backside to clean up. Initially I had added the 100 mm high Perspex fence around the edges of the table and this kept greater than 90% of the chips on the table but still a mess to deal with so an easily removable dust hood was in order. One I had seen while surfing the net was held in place with magnets so this idea has been adapted to my needs. The brush is from truck wheel arch spray stoppers designed to help stop water spray from the wheels of large trucks in bad weather. 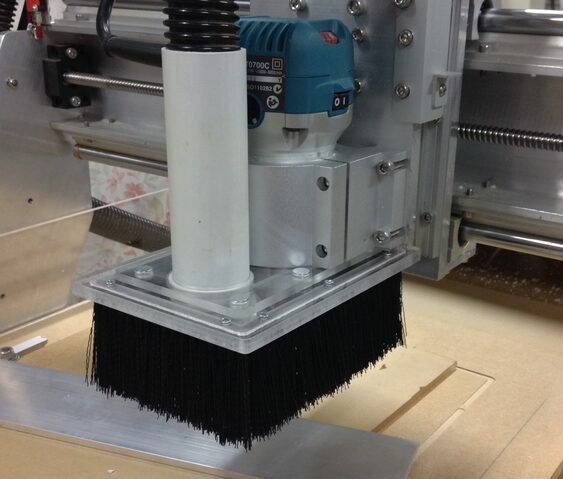 The brush is 100 mm in length but I have cut this length down to about 60 mm as this will allow full cutter depth without stopping the Z Axis plunge as the bristle is quite stiff and as it will be mounted to the Z Axis I have to make sure it won't stall the stepper by hitting the work before full cut depth is reached. Time and testing will show how effective this is going to be as it will leave a small gap under the brush when cutting first starts but hopefully the vacuum attached to the hood will stop most chips escaping. The small very strong Neodymium magnets are still to arrive and will fit the six small pockets cut into the upper and lower plates seen in the video. The upper plate you see me stick down and then cut the pockets for the magnets was previously made some time back to hold the vacuum tube in place so I had to come up with some way of holding it while cutting matching pockets for the magnets, the double sided tape was the answer. Today I had a look at the V carving again and decided that it could benefit from a deeper cut so off to the local tool shop to get a 60 degree V bit and this afternoon I ran the code again. The difference is considerable and will allow a much more secure inlay to be glued in place and the detail will require very little cleaning up before the inlay is done. I sat for some time just looking at the carving and I still find it impressive that this little machine I've made is capable of such detailed work and performs it with ease, much more to come. It was really very nice to go out to the shed today with laptop under my arm and just plug it into the CNC, power everything up, load the G Code, reference zero and hit go and just have the results appear before you with n o fuss, no lost steps, no noisy steppers. This is how it's supposed to be isn't it. I had gone to the trouble off borrowing a couple of different stepper drivers to try and solve the noisy steppers and missed steps at slow speed when stepping any finer steps that half stepping but today I produced this with the half stepping settings and I think I've decided to stay with that. The other drivers I had borrowed were Gecko G201's and I had little info on setting them up and some info I read said you needed a special setup in Mach3 to run them. As I only had two I was unsure as to whether I should run a mismatched system so I chose not to at this stage but while reading about them it mentioned about the exact problem I'm having and that there is a trim pot on the Gecko driver to adjust the driver just for this issue. Well only one of the borrowed boards has the trim pot, the other has fixed resistors so anyway as mentioned I chose to stay with half stepping as it seems to do a pretty good job for me and well the proof is in the pudding as they say so my two most recent jobs the toothed sprocket and the V Carving today have gone without a hitch so don't fix it if it's not broken. 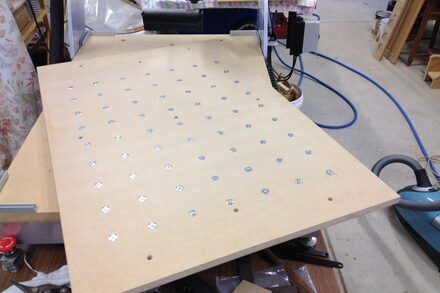 The test run is for the lid for the jewelery box as shown before so now to find a nice piece of wood to make it out of. My young brother is into wood turning and has a few mates that do fine woodwork they should be able to point me in the right direction. 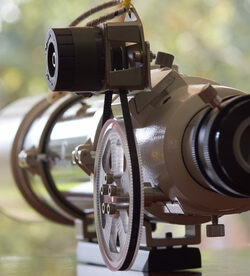 This is the finished job of the toothed sprocket in place on the telescope with stepper motor. The setup allows me to remotely focus the telescope with camera in place via my laptop and save me having to get down on my knees to look up through the camera and scope while trying to focus manally. A great time saver and also saves the grass stains on the jeans as it's often quite damp at night when the telescope is out. The focuser has the ability to adjust the focus to within less than 0.005" at a time so it's very accurate and functions in conjunction with my Astro software, very handy. 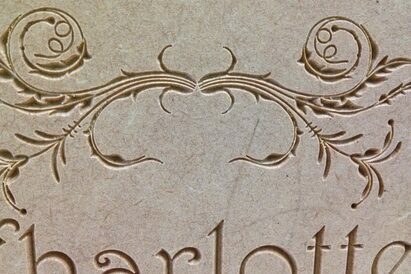 One of the next jobs lined up is a Jewelery Box for my 9 year old granddaughter Charlotte and some very nice V carved flourishes are in order. In the gallery you will see the proposed lid and front panel for the box, I intend to run a dummy run on some MDF to see how the pattern looks for depth etc before committing to a good piece of wood. I have also managed to get hold of a different stepper driver to try on the X Axis to see if I can microstep without the issues of lost steps I was having. Currently I'm only half stepping the motors and while that's fine for most things it does leave some not so smooth finishes on curves and oblique cuts so more to come on that. Well finally some good news on this blog, it would seem that I've sorted the issue of the noisy and rough running of the X axis stepper. It's still unclear as to why this apparently only affected the X axis and not the others but what I was doing was trying to drive the steppers in 1/4, 1/8th and micro stepping 1/16th steps all in an attempt to get it to run smoothly. 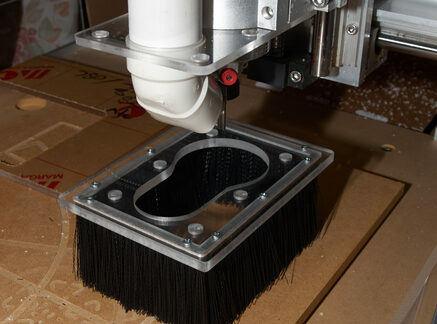 The result was achieved by reducing the step count to 100 per mm, this works out to be half stepping, 400 steps per rev and it runs quite smooth and fast with good speed transitions, no more grumbling and groaning and dropped steps. Of course there will be a lot more testing but I feel confident that there will be no more problems. Having said all that the only concern is loss of some accuracy but when looking at the numbers that shouldn't be a problem either. Effectively 1 step is equal to a total axis movement of only 0.00039" or 0.01 mm so for everything I intend to make this theoretical accuracy is well within desired tolerances. Lots more jobs on the drawing board, some that have been waiting for months so drop back in and have a look to see what's happening every now and then as now it's just up to my and my wife and daughter's imagination as to what gets put on the table for cutting and I think they are making lists for me. Today I had a friend around and I was showing him the CNC machine and also the issues I am having with the X axis stepper and rough running at slow speeds. In the process of changing settings to demonstrate the problem at its worst I changed the step rate to 100 steps per mm, I hadn't gone this low before but to my surprise the running was makedly improved and the rapid speeds achieved were up to 1500 mm per min. I tried to go higher but started to run into stalling issues at around 1600 mm min. so I backed it off to a stable setting. Tomorrow I will try some different pulse width settings to see if I can improve things a bit more. This was a good day and a bad day, the video tells the story. This little job cost me my new 1/4" tungsten cutter an lucky for me no injuries, it could have been quite different though. A reminder to always think safety when working with this or any type of powered machinery. I recently had a need for a toothed sprocket to be driven by a stepper motor with a toothed belt. 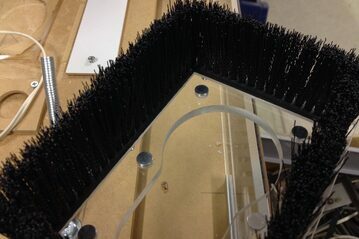 The parts were recovered from a scrapped printer other than the sprocket needed so a perfect job for the CNC. 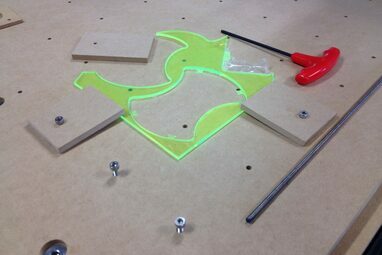 The job is from 8mm Perspex sheet 120mm square, machined both sides. All done with a 1/4" and a 1/8th" straight cutter. I am still having issues with the X axis stepper not running smoothly when transitioning speeds at lower speed ranges but have been able to get around the problem by slowing down the feed rate and doubling the step count per mm. It's not perfect but it is allowing me to use the machine. I was lucky to get this off the table at all after what you have seen in the video and what happened before that was the computer rebooted itself, fortunately it was in-between cuts and the machine was in it's home position so I was able to restart the job without loss of position, I just needed to re zero the Z height as I was changing tools anyway. So it all turned out ok in the end and so I'm now planning some more jobs while still trying to resolve the X axis issue. Finally something a little more meaningful from this machine but only after an injection of more funds to purchase an Ethernet Smoothstepper motion control board. While this has made for very reliable operation it has not in all cases made the stepping smooth this is something that I'm still working on. What it has done is allowed the inches per minute speed to to go from the original speed of 15 inches to a comfortable 43 inches per minute and even up to 100 inches per minute but at the speed the X axis becomes unreliable and loses a large number of steps. Upon return to Zero at the completion of a non cutting test run with feed speed in the tool pathing set to 100 ipm the X axis had lost approximately an inch and a hal f of steps while the Y and Z had been able to maintain there positional accuracy. So the only conclusion I could arrive at was the X axis stepper does not have sufficient torque to maintain it accuracy at that speed even after upping the motor current limit, this only succeeded in making the motor run hot, 85 deg C was measured during the run so the current was dropped back to a more acceptable running temp of around 65 deg C.
The V Carving was done with Vectric VCarve Pro Demo version and this trial Toolpath for the "Bulls Head" sign. This was scaled slightly smaller to fit my bit of wood and the feed speed set to 33 inches to be sure of not loosing steps. The results are what you see and I was happy with that. The stepping is still a bit noisy during some speed transitions even at the lower feed speeds with the smoothstepper, still to be resolved. Here we are again, this like back to the future I guess as I'm back to making train wheels, that's just my test piece I use though as it's a good multi path multi tool job and makes a good job to use to test the machine isn't loosing steps. Anyway I felt confident that it was running good enough to do a template for my lovely wife Carol, got to keep the other half happy now don't we. The one major difference with this job was that it required some engraving and this was a first for me and the machine, but as you can see it all worked fine. 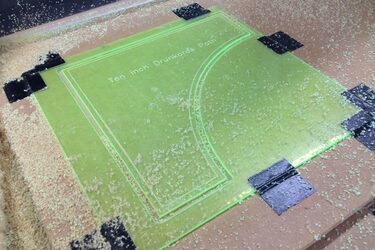 The final cut was to have tabs but I'd done the tool path for 4mm Acrylic and this was 3mm so the cut through took the tabs out by about 0.5 mm. So how did I get it all working, I put my good Win 7 Desktop in place of the old clunker of a PC running XP. I had even installed a second PCI printer port in the old machine but even that had failed. Although it is running and finally at a reasonable speed with rapid of 1100 mm min or about 43 inches a min it's not too bad and fast enough for what I'm doing, it's certainly a lot better that the less than half that speed I was getting with the old single driver board. 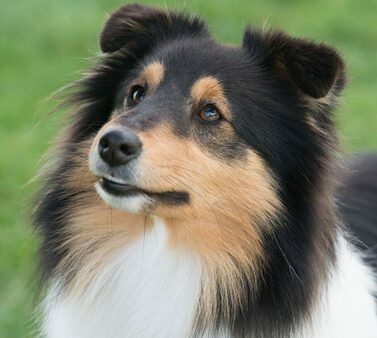 Finally I have ordered an Ethernet Smoothstepper to try and refine the motion as it still growls the steppers at some speeds mostly during transitions or running at some oblique angles so that should arrive in the next few days and then begins another little saga of configuring that. More to follow as usual. Well, miracle, mystery and intrigue, definitely the unexplained. The bottom line is though that for some unknown reason when connected up to the new kit including the break out board and the three individual stepper controllers it suddenly decided to fire up and all three axis worked as advertised. So you tell me, if you’ve read the post previous you will have read about the efforts I’ve been to trying to rectify the drive failures only to have it suddenly work in the configuration that had failed so miserably before. The big test now is will it keep on working? I did return to the shed after tea and booted it all up again just be sure I wasn’t seeing things as this had been a mystery for about two months now and yes it’s still working so some tests to come to check normal operations, some test cuts of items I had originally made to compare, so tomorrow if time allows before work it will be put to the test so again wish me luck, reports to follow.